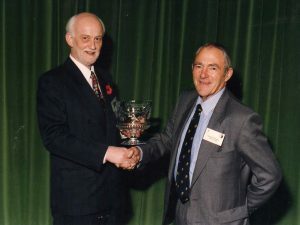 Donald Frampton (right), one of the original Trustees, presents an engraved bowl to Bewley lecturer Professor Donald Grierson of the University of Nottingham in 1997. The GCRI Trust was established in 1989 when the Glasshouse Crops Research Institute (GCRI) became a part of Horticulture Research International and ceased to exist as an independent legal entity. It was the brainchild of Dr Ron Fraser, Head of Station at the time, and was conceived as a means of carrying forward the assets and objectives of what had been, up to that time, the GCRI General Purposes Fund. In turn, the General Purposes Fund dates back to 1954 when GCRI was established at Littlehampton on the South Coast. The Fund was set up with the residual of donations given by growers in the Lee Valley in support of the Cheshunt Research Station (which preceded GCRI), and was concerned with matters relating to staff welfare. In particular, it provided loans to staff members for house purchase, it gave support to the GCRI Social Club and subsidized the staff canteen. Until 1975, the General Purposes Fund also received the annual income of a GCRI Subscription Scheme which was open to commercial companies and individual growers. Subscribers (258 by 1974) received the Annual Report, were able to attend Open Days and, after 1961, receive seed of new tomato varieties bred at the institute. However, in 1975 the Scheme was re-launched as the GCRI Association and the income from this was diverted to a separate Fund. The setting up of the GCRI Trust in 1989 brought with it charitable status and a re-definition of Objectives. These now focussed on the promotion of scientific research and education bearing on the cultivation of protected crops, mushrooms, bulbs and shrubs. Giving support for overseas travel by scientists and others associated with the horticultural “Industry” was perceived as having particular merit. Trustees, comprising roughly equal numbers of researchers and commercial growers, have overseen the activities of the Trust from the start, with administrative assistance provided by the host Institution. The award of travel grants continued to have first call on Trust expenditure following the closure of GCRI and the relocations of the Trust’s administration first to Warwick HRI in Wellesbourne (1994) and then in 2010 to East Malling Research in Kent. Responsibility was also assumed for the continuation of GCRI’s Bewley Lecture series and, for a period the provision of student scholarships associated with appropriate MSc courses at the University of Warwick. With the closure of GCRI, funds held by the GCRI Association were transferred to the newly created Horticultural Research Association (HRA) which, in recognition of this, instigated the payment of an annual grant to the GCRI Trust to increase the annual travel budget. Effectively, investment interest from subscriptions paid by the horticultural and wider scientific industries once again came to the Trust. An annual grant was also paid by the HRA to the Vegetable Trust (a sister Trust deriving from the National Vegetable Research Station at Wellesbourne) and when, a few years later, the HRA was dissolved, its assets were split between the two Trusts in pro rata fashion. Another chapter in the Trust’s history opens with the demise of Warwick HRI and the decision by the Trustees to relocate the Trust’s administration to the East Malling Trust based in Kent. There are no immediate plans, however, to change the Objectives.